We’ve got a new Borderlands 3 trailer and I gotta say, Gearbox are really treating us. This is the third trailer we’ve got this week, and as always, there’s quite a bit to pull out of the one minute and 26 seconds of gameplay footage. Some of it we’ve seen before, some of it doesn’t tell us much, but what remains tells us who the baddies are, what some of the locations are called, and even some of the specific abilities our Vault Hunters have. 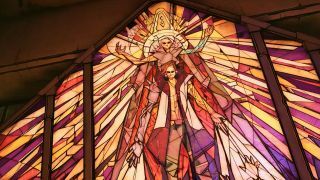 Below you’ll find all the details I could spot in this new Borderlands 3 trailer, and make sure to look at our previous Borderlands 3 trailer breakdown to make sure you don’t miss anything related to Borderlands 3. Turns out those leaks were right! Our Vault Hunters are called Moze, Flak (or Fl4k), Zane, and Amara. Moze is the gunner who can summon a mecha like Overwatch’s D.Va, Flak can summon either Rakk, Spiderants, or Skag to help him in battle, Zane has a drone that does… something, and Amara is our melee-based, punching Siren. You’ve already picked which one you’re going to play as, right? 2. Why are Amara’s eyes yellow in this bit? By the looks of it Amara usually has blue-ish eyes to match her tattoos and hair, but in this brief excerpt she has orange eyes. Why? The Calypso Twins have light blue eyes, and previously I thought the eye colours of their worshippers might change when they were brainwashed, but now I’m not so sure. Amara’s sudden change in eye colour could be something to do with her skill tree, or perhaps she’s just got some killer contact lenses in. Yup, we now know that the baddies are twins, and that they don’t seem to be under the thrall of a Siren called Calypso. Unless they’re keeping that quiet for now, that is. Either way Tyreen and Troy have probably adopted the name as it’s associated with seduction and *cough* brainwashing in Greek myth. Considering their cult is named Children of the Vault and that is advertised brainwashing in an earlier trailer, it’s safe to say that the pair are using clandestine means to get the bandits clans to follow them. In the background in the bayou environment you can see a fast-travel station with its trademark spinning blue globe. The word ‘Mansion’ is emblazoned on the side of it, but it’s hard to tell whether it’s the second half of a location name or is merely referring to a big, imposing home in the area. Considering that big T-Rex-like Skag lives in the Bayou, there’s a good chance that the Mansion might be home to the huntin’, shootin’, fishin’ Hammerlocks. Look, I’ll be honest. I have absolutely no idea what’s going on in this place. It’s neon pink, purple, and seemingly populated solely by Midgets, the enemies found in previous Borderlands games. The mixture of French and Irish words in the name is just bewildering, so whether this is a settlement or a shoot ‘em up stronghold, I have no idea. Help. Oh, Roland. I miss you. If you do too, rest assured that at least one bit of him remains in Borderlands 3. His Crimson Raiders are returning, as you can very very briefly see them lounging around in the street. One of them is even doing push ups, and in the previous trailer they were seen clustered around Zero and Rhys. Hopefully they’re helping out some fellow Vault Hunters in memory of Roland, as it would sure be heart-breaking to have them turn on you. We’ve seen Flak with a skag happily ripping out throats by his side, but that’s not the only wild animal he can have as a pet. In a blink-and-you’ll-miss-it bit of the previous trailer you can see Spiderants, Rakk, and Skags behind him, and in this trailer there’s two rakk soaring in front of him. Rakk are considerably easier to kill than other wild creatures in Borderlands, so the game might let him have two rakk instead of one to make up for their squishy bodies. Striding through the various worlds in Borderlands 3 in a mecha as Moza probably does wonders for your self-confidence, and now other Vault Hunters can tag along with Moze too. Zane is seen riding on the back of her mecha in the trailer and firing at the same time, so you don’t have to worry about your teammate steaming on ahead without you. Plus riding a mecha is pretty damned cool. You’ve seen Goliaths that run around with bloody skulls for heads, you’ve watched giant tentacled beasts sprout from the ground, and you’ve gazed in horror at Midgets riding towards you on the backs of skags. But have you seen a humanoid cat wielding a gun? No? Well, you will in Borderlands 3. They’ve probably got a really horrendous melee attack, considering they have claws and all. Hearts come off of Flak’s tamed skag and good god, I am going to protect that tiny little monster with my life now. There’s even small spikes coming out of the hearts, just in case you thought Borderlands 3 was getting a bit too mushy.